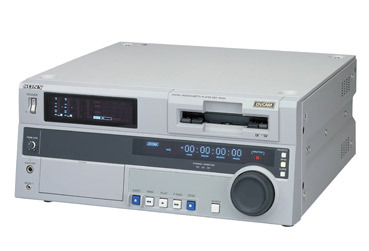 Sony DSR-1600A DVCAM Master Series Digital Videocassette Player with i.LINK interface. DVCAM Master Series Digital Videocassette Player with i.LINK interface. The new DSR-1600A has i.LINK interface as standard signal input/ouput. The DSR-1600A DVCAM player offers jog audio, slow motion, and editing performance. The DSR-1600A has built-in jog/search dial, multi-format playback capability of DV (SP only) and DVCPRO25, and can accommodate all 25 Mbps cassette sizes without the need for an adapter, or menu setting changes, for playback. The full range of analog and digital inputs outputs include SDI, SDTI, i.LINK, and AES/EBU digital audio, composite , component, and s-video analog video, making the DSR-1600A a very versatile digital video source machine. Playback Time Standard size: More than 184 min. Mini size: More than 40 min.